The great Scottish poet Edwin Morgan passed away nearly two weeks ago and the tributes and accolades have continued throughout the Edinburgh Book Festival that’s just ended. I’ve been fortunate to follow much of it via Twitter, having connected with such wonderful poets and poetry lovers as @ByLeavesWeLive, @OneNightStanzas, and @craftygreenpoet among others, who have made me feel like I was there alongside them, paying my respects. Morgan saw the magical in the ordinary and wasn’t about to limit himself by the constraints of either subject matter or style. He could be funny, such as “The First Men on Mercury,” but he was equally adept when he turned his hand at tender, more traditional love poems. One of my favorites — probably my favorite Morgan poem — is “Strawberries,” which you can read in its entirety at the Edwin Morgan Archives at the Scottish Poetry Library. Have you ever felt a deep longing for something or someone? Someone from your past, perhaps, or a place or time for which you feel an intense, nostalgic yearning. losing is the darkness inhabiting that street. Desire is to longing as longing is to losing. as longing makes mystery of desire. unfolding of the world into what longing desires. Frankly, I’m not sure the word saudade can ever really be described in English; we just have to feel it to understand it. What do you feel saudades about? When I lived in Alaska, I heard a story from an Inupiaq man about the Qupqugiaq, a legendary ten-legged polar bear who renounces violence and tries to create a love-based community. He also told about a time when some hunters came across a Qupqugiaq that had fallen into an ice hole and was struggling to get out. Rather than kill it, they decided to help the bear out of the hole. This seemingly impossible task took a lot of team work. The more they struggled, however, the harder became the task. Only when they stopped and stood still for a moment did they realize their frantic actions were useless. Once they calmed down and worked in concentrated harmony the task became easier and the bear could be freed. How often do we let the tasks at hand get the best of us, when what we really need is to calm and slow down? poetry & heart & soul RT @greenskeptic: @slboval @GarrettMelby @jerrycolonna Business needs more poetry! The real news in my talk was about the importance of allowing poetry into our lives as business people — and yes, of opening our hearts and souls, too. I also talked about how many poets take up other professions. Many are teachers, of course, but I was thinking about other professions: doctors, insurance salesman, vps of marketing, copywriters for ad agencies, bankers and publishers, to name a few famous examples. This is a good thing, both for poetry and for business. We need a greater understanding of the emotional ties and the spiritual side of the work we do. So much of our lives are spent among this certain group of people, who are not our family and not always our friends, but who nevertheless represent important relationships. Together, we are a corpus, an enterprise of humanity, and there is much to be learned from our interactions. Poetry can be a means to tap into the stories we share; for poetry, with its economical use of language, connects us with our compassionate selves as managers and as business people. Poetry can teach us how to find the balance within life and work, rather than between life and work. We need poetry for exactly what can be found there and what it can bring to our lives in the office. 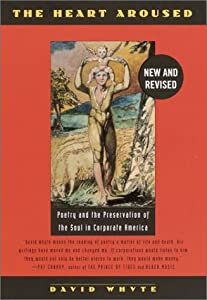 David Whyte, in his book The Heart Aroused, describes the need for poetry in what he calls “the fight to save the soul of corporate America.” Business people who bring poetry into their business lives and poets who bring their business lives into their poems are also saving poetry by making it more relevant to people’s lives. This can only be a good thing for the future of poetry in America—and for business. I’ve been on vacation this past week on the North Carolina Coast. Oak Island is one of the south-facing islands that are not part of the more famous Outer Banks and neither as far south nor as celebrated as Myrtle Beach. We like it there because it is quiet and sleepy in an old-fashioned way. It is a far drive from Philadelphia, but these days you need to go pretty far to get far away. 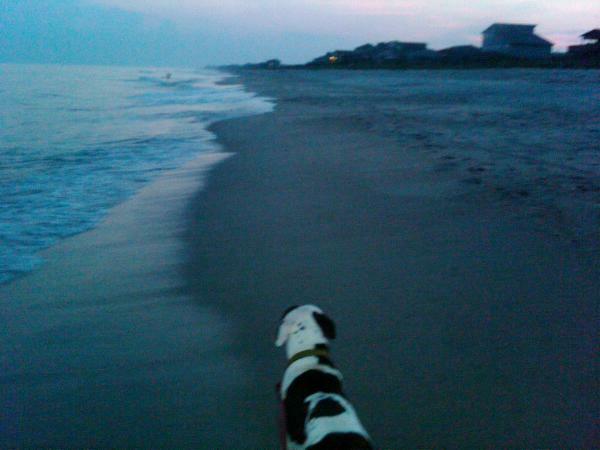 Being on the beach reminded me of two poems I wrote about other Atlantic Coastal vacations, back in the early 90s. They cull glass from the sandy surf. forsaken like jetsam of the sands. who drops the sputtering gull under a tree. body turning round a point, compass tracing a circle. only wider, concentric, thirty feet overhead. powerful paws slapping down motion. in the bay breeze. She is Spartina, waving in wind or water. lofting on the incoming tide. tethered, like all of us, to fate. I hope your vacation plans take you to a coast somewhere. “The sea is a cleanser,” as a good friend wrote to me recently. Let’s hope that’s true, for the sake of the Gulf Coast.